Close your eyes. Imagine yourself as the Snow Beast. You've just curled up in your favourite cave for a nice, long nap. Just as you start to fall asleep, you're jerked awake by the shouts of frolicking Terror Mountain residents. What do you do? Throw avalanches of snowballs at them, of course! This game is not unlike Turmac Roll: you're rolling and jumping, trying to collect various items. The only difference is that you're rolling in the opposite direction, down a hill, and growing all the way. Sounds a little overwhelming, huh? It is the first couple times, but it's fairly easy once you get the hang of it. You simply use the arrow keys to move back and forth across the screen to pick up items and the space bar to jump over barriers. The only thing to keep in mind is that it takes a little time to move sideways because you're rolling so fast, so don't try to get every item at first. You'll need to hit the spacebar about this far away to make it over the obstacles. The items you want to hit are the ones with red arrows over them. Anything else will cause you to lose an item and decrease size if you hit it. If you hit too many things, you'll become too small to continue rolling, and the game will be over. There are three stages, each with multiple levels. If you pass one level, you'll be able to choose which path you want to take. Simply press the arrow key that corresponds to the one you want. It doesn't matter which one you pick because the result is completely random. 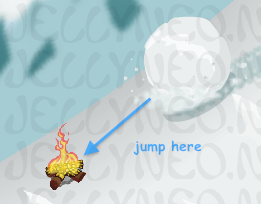 The following are the obstacles from stage one (excluding the fire shown above, which is also an obstacle). There is also a house, shown at the bottom of the guide. 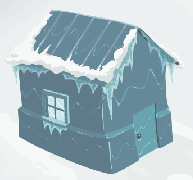 The obstacles change slightly when you move to stage two, but they are usually just icy versions of the original ones. The following are some of the items that you can collect during the game. Some of them have multiple color variations, including (but not limited to) the poogle racer, chia, brucicle, negg, slushie and chia pops. Two of the slushies have special powers. The black slushie increases your traction, which speeds up your snowball and makes it more difficult to dodge obstacles. The white slushie turns your snowball into a black hole, which attracts all of the items that give you points so you can focus solely on avoiding obstacles for a short period of time. Don't run over your storagehouse or you'll start losing items!